It's Lovely! I'll Take It! : "i'll post better images soon." Oh good. I was looking for a house where I could... make wontons? Am I the only one who thinks that this is really a personal ad disguised as a "for rent" ad? Why else would a guy post a photo of himself cooking, and a long description of the cabin that features details about his personal life unless he was hoping for a companion in addition to a tenant?? I was thinking personal ad too. Cheaper than eHarmony I suppose. Wally needs to get himself a spellcheck. The little comments about cats and dogs ok creep me out with the purr and woof- I agree with the companion search theory. Personal add or "for rent" add, it's weird either way. And why a picture of the wontons when there are 3 lines about flowers and the garden? At least show us that. Wally does not have any meaning in Canada whatsoever (other than "short for Walter"); what does it mean in the UK? 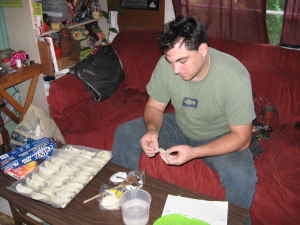 And is he making perogies (wontons - pfft) in the living room because every surface in the kitchen is covered in stuff? The "purr" and "woof" are standard for any rental-housing advertisement on craigslist to indicate that the specified type(s) of animal(s) is/are okay. I think they're ticky-boxes when you take out the ad. Nothing creepy involved. But the ad is kinda weird. And no, "Wally" doesn't mean anything in the US other than "short for 'Walter.'" In the UK, Wally essentially means idiot. The purrs and woofs are craiglist defaults, so not down to him, but an odd ad even so. I'm putting my bet on dumplings/potstickers. Mmmmmm. Wally should take a cue from those plastic-wrap bed fans. Just think how much more counter surface he'd have for cooking. Oh, rats! Another post gone before I got to see it.